When you write content for your website and your blog, who are you writing it for? If you answered by saying, “my audience”, you’re only partially correct. You see, speaking to a general audience is a bit too broad. The only way to generate qualified leads is by drilling down into who your audience truly is. The truth is, your service is meant for individuals with specific problems that only you can solve. And those specific individuals need content that is tailored to fit them, not everyone else. Why? They are who your service will benefit the most—the ones who are most likely to crave what you have to offer. And so much more. 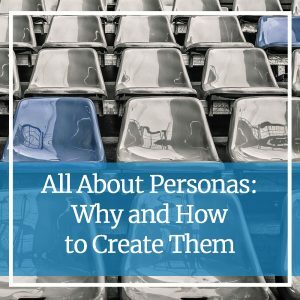 Personas—also called avatars—allow you to understand your customers on a deeper level, showing you how to speak to them in the best way. Sure, you may be able to quickly create an ideal customer off the top of your head using demographic information such as age and gender. But, this is still too general by itself. Your customers are unique and have so much more to offer than simple demographics. If you can tap into and speak to their unique attributes, you’ll connect with them in an invaluable way. The beauty of each persona is this: there isn’t one just like the other. In fact, that’s the goal. You want your persona to be unique to what you have to offer. To get started, grab a piece of paper and a pen or open a new document. This is the best part. This might seem silly, but putting a name to your persona is important. It helps you to better connect with your persona and begin to create conversations involving this persona. And, truly, this persona is real, just in a broader form: your ideal audience. Demographics are important for targeting the right niche. Start by taking down your persona’s age, gender, location and other demographics such as their education and job title. Your persona’s demographics will start painting a picture of an individual instead of a crowd. What are your persona’s goals? What goal does your persona have that your service can help achieve? This is where you’ll lay out why they are seeking out your service and how you can help. What are your persona’s challenges? Define your persona’s challenges when it comes to reaching that goal and what you can do to help them overcome them. What are your persona’s values? Your audience will value certain things over others. What does your persona value? Maybe they value good communication or a high work ethic. Whatever it is, you’ll want to show how you can deliver on those values. What does your persona fear? What does your audience fear during the process? Are they worried about the price of your service, or the time investment? Discover those fears so you can demolish them in your content. Where does your persona hang out? Who does your persona turn to for support? Entertainment? Knowledge? What sites do they visit online? Put all this information together and you have a unique-to-your-audience persona. Need Some Help Creating Content for Your Audience? Sometimes, creating content can just be too much. That’s okay. It’s why we’re here. If you need help creating content, in your voice, for your audience, reach out to our team today by calling 612-643-1824 or send us a quick message.